It’s impossible to have a conversation about street art without acknowledging Jean-Michel Basquiat‘s enormous contributions. As an artist, nothing was off limits for Basquiat, who reveled in dealing with hot button issues from politics to class. Viewing a Basquiat in person affects all of the senses simultaneously. What at first glance looks infantile or created in haste is in fact layered with intricate themes. It’s the paradox that grabs you. It’s hard to believe that Basquiat, whose visions were so prophetic and sage, was only 27 when he died in 1988.
WHO: Basquiat got his start in the 1970s with aerosol cans and graffiti tags. The ’80s offered him plenty of opportunities to showcase his work including more formal settings like the famed Gagosian Gallery. Ultimately, Basquiat got wrapped up in the art scene’s drug fueled underbelly, and we lost an artist that still had so much to give. 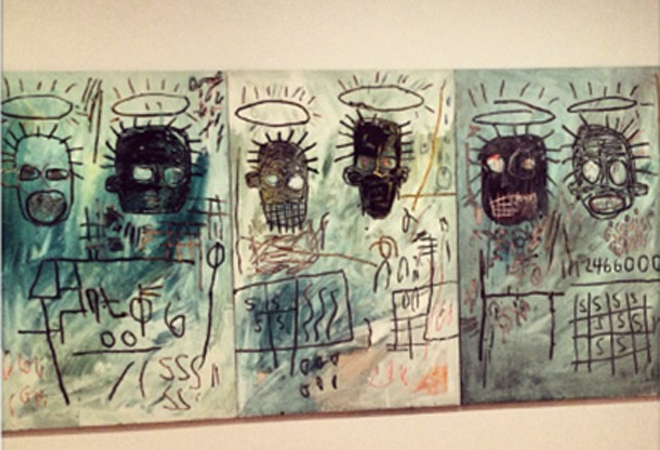 WHAT: Basquiat’s original artwork is spread throughout the world, but you can get your fix in downtown at MOCA. The foundation that controls his work keeps a tight lid on Basquiat’s art, rarely licensing its use in pop culture products. Thankfully, the Foundation has granted Ventura-based clothing line Neff (founder Shaun is a huge Basquiat fan) permission to use a few images for an exclusive, limited edition line. This means that ordinary people can finally afford a Basquiat. Don’t even think of borrowing mine. I’ll decline. Follow Eva Glettner on Instagram as she scopes out L.A.’s finest street art.